Lamara Kelesheva carried out her son's wishes by using a surrogate maternity program to give him biological children -- but now the courts say she can't legally raise them. Kelesheva’s son, Mikhail (Misha), received a diagnosis of acute leukemia in May 2005 while studying at a technical college in Greece. He was 23. Before beginning his course of chemotherapy, Misha was given the chance to conserve some of his sperm. This is a usual procedure in such cases, since after chemotherapy, the chances of becoming a parent naturally are small, but the patient may still be able to have children through in-vitro fertilization. Misha was happy to have this opportunity; he always wanted to have children. Children are an important part of his large extended family. Misha himself was one of 10 siblings and Lamara has 46 first cousins spread across Russia, Ukraine, Georgia and Greece. Now Lamara needed to find two women: one to contribute her eggs and another to act as surrogate mother and carry the child. And besides that, she needed money. Surrogate maternity is not cheap. A single try can cost tens of thousands of rubles. Her extended family all chipped in. First Lamara went to a clinic in Georgia. Five attempts there failed. Greatly discouraged and with little hope of success, Lamara decided to try one last time at a clinic in the Ukrainian city of Donetsk. To increase the probability of success, she arranged to try there with two surrogate mothers. Both mothers became pregnant on the first try, and moreover, the sonograms showed that both women were carrying twins. On Jan. 6, 2011 Ioannis and Feokharis were born in Moscow, and two days later (Misha) and Maria appeared. 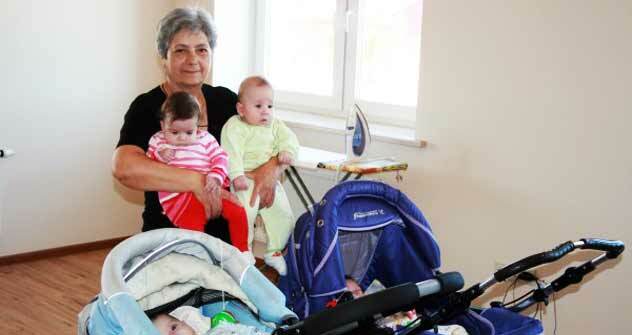 Since their birth, the babies have been cared for by three devoted women: Lamara, her younger sister and a nanny; Lamara’s husband divorced her shortly before the grandchildren’s birth. But Lamara is confident that she will be able to give the children everything they need to make them happy. She is still a fairly young 57, and she has the means to bring them all up. But problems remain. Although the babies are already five months old, they still don’t have birth certificates. The local registry office refused to issue them on the grounds that in Russia, only married couples may use the services of surrogate mothers. However, last summer, a local court established a precedent by ruling that a single father could register his child born of a surrogate mother. For the first time not only in Russia, but in Europe, a single father was issued a birth certificate for a “surrogate” child with the line for the mother’s name crossed out. Lamara took her case to court, but this time the judges saw differently; the court ruled against her because she does not have a husband. What are Russia’s laws on surrogacy? Unfortunately, Russia has no special surrogacy law on the books. The existing provisions of the Russian Federation’s Family Code and the Law on Civil Status Acts establish only the procedure for registering “surrogate” children. A record of parents’ names can only be entered into the ledger of births subject to obtaining a preliminary agreement from the surrogate mother. What’s more, this situation is illustrated using an example of a married couple – the law only covers one of several potential situations. The meaning of this provision, however, is not that only married couples are allowed to use the services of a surrogate mother in Russia; rather, it’s that in order to be put on official record as parents, the new mom and dad must first secure the surrogate mother’s official consent. The specific legal provision regulating the procedure for registering “surrogate” children is sometimes used to come to the absurd conclusion that unmarried people cannot have kids. This is not true. Eight times over the past three years, various courts in Moscow and St. Petersburg upheld the right of single, unmarried people, both men and women, to reproduction via a surrogacy program. Russian courts have sided with people who have become parents through surrogacy and with their newborn children. I am confident that Lamara Kelesheva has the right to be listed as the mother on the birth certificate.